If you are interested in signing up for our April 13th-15th workshop you need to do so soon. We only have a few spots left. We also have updated and clarified the schedule below. Register at www.makeLab.eventsbot.com. Friday April 13th: 6pm – 9pm: Review fabrication, assembly and operation of a mini CNC mill. Introduction to the makeLab, equipment and processes. Saturday April 14th: 9am – 6pm: Fabrication of a PCB board with one light sensor that activates an LED. Each student will fabricate and program the same board with assistance from the instructors. Sunday April 15th: 9am – 12pm: Finalize and demonstrate boards. Students will use remaining time to experiment. 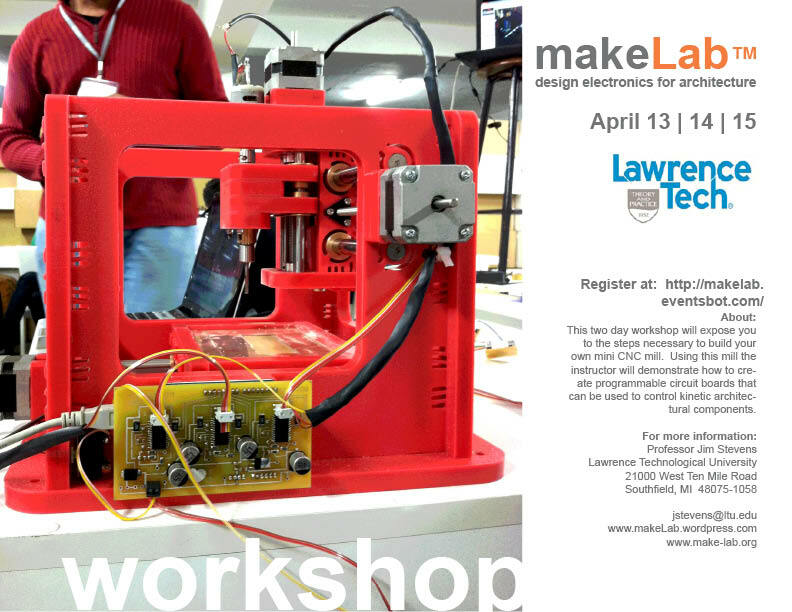 Note: The workshop will be held in the makelab at Lawrence Technological University. Maps to the makeLab™ are available from the “map to makeLab” link on www.makelab.wordpress.com. Is this workshop for current students only or are alumni invited to participate as well?